Living... by himself, now that his fiancée Piper is serving time in prison. It’s lonely and scary and not at all what he signed up for when he proposed. Piper had a secret past as a (female) drug dealer’s girlfriend that only recently came to light. Profession... freelance writer making his name thanks to Piper’s story. He appears on NPR to talk about his new long-distance relationship and writes a column about her life in prison. She feels like she’s being taken advantage of, but Larry has a career to think about. After all, when a story like this drops into your lap, what else are you supposed to do? Relationship Status... engaged, but not sure for how long. Long-distance relationships are tough even when you don’t have to fill out forms to see your significant other and when more touching than just a “hello” hug is allowed. Challenge... getting over his silly insecurity about his fiancée being in prison with her drug dealing ex-girlfriend Alex. 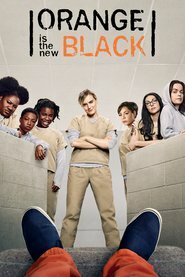 Piper says her lesbian past was just a phase, but could that phase have a sequel now that she’s in the same prison with Alex? Luckily, he has some leverage and can cause problems for Piper from the outside. He often goes on the radio to talk about her story, but makes fun of her fellow inmates…while they listen alongside her. Personality... jealous and spoiled, but sweet and caring. His parents have coddled him and told him he was incredible ever since he was a baby. His mom once said, “You’re the best soup-eater in America.” Shockingly, that’s not an attractive quality to a girlfriend. Hopefully, Piper’s imprisonment will be a growing experience for him. Larry Bloom's popularity ranking on CharacTour is #3401 out of 5,000+ characters. See our top-ranked characters and read their profiles.